The trigger in China’s case is perplexing. Yes, the stockmarket is down a third over the past month, but that has simply taken it back to March levels; it is still up 80% over the last year. Growth, though slowing, has stabilised recently. Other asset markets are performing well. Property, long in the doldrums, is turning up. Money-market rates are low and steady, suggesting calm in the banking sector. The anticipated correction of over-valued stocks hardly seems cause for much anguish. […] The government has staked much credibility and prestige on the stockmarket. When the going was still good, the official press was chock-a-block with articles about how the rally reflected the economic reforms that Xi Jinping, China’s top leader, was set to push. Li Keqiang, the premier, said repeatedly that he wanted equity markets to provide a bigger share of corporate financing—comments, from punters’ perspective, not unlike waving a red cape in front of a bull. The sudden end to the rally is the first major dent in the public standing of the Xi-Li team. The botched attempts to stabilise the market only make them look weaker, giving succour to their critics. […] The bottom line is that China is not as exceptional as its leaders claim, or as some Chinese and foreigners imagine. It is not immune to laws of economics, the business cycle, or the gradual slowing of national economic growth and power accretion that typically besets maturing societies. And Beijing has not created a superior hybrid state-market model that can miraculously reap the benefits of more market- and legally-oriented economies while avoiding their drawbacks. Instead, it has created a massive bureaucracy that is strong and concentrated in some respects, but weak and conflicted in others. Moving forward, in assessing China’s prospects, analysts need to take a hard look—in part by considering the issues outlined below. Far more than simply a market crisis, the Chinese leadership views turmoil on the Shanghai stock exchange as a potential security threat to the regime. That helps explain the barrage of measures unleashed by financial authorities to counter a sudden market downturn that threatened to shake public confidence in the government. In that sense, the unprecedented rescue moves, including a multibillion fund set up by Chinese brokerages at the government’s behest to buy blue chips, is a preview of what’s to come following the passage last week of a national-security law [background] that massively expands the definition of threats to the state to cover almost every aspect of domestic life, including “financial risk,” as well as international affairs. The law explicitly states that economic security is the foundation of national security. The faltering of these measures has put an embarrassing dent in the halo of unruffled supremacy built up around Mr. Xi’s administration, and this past weekend his government doubled down again, betting that it could beat bearish market sentiment into submission. Unlike his predecessor, Hu Jintao, Mr. Xi has taken direct control of economic policy-making. He and the premier, Li Keqiang, the country’s second-ranking official, have been mute on the stock market’s difficulties. 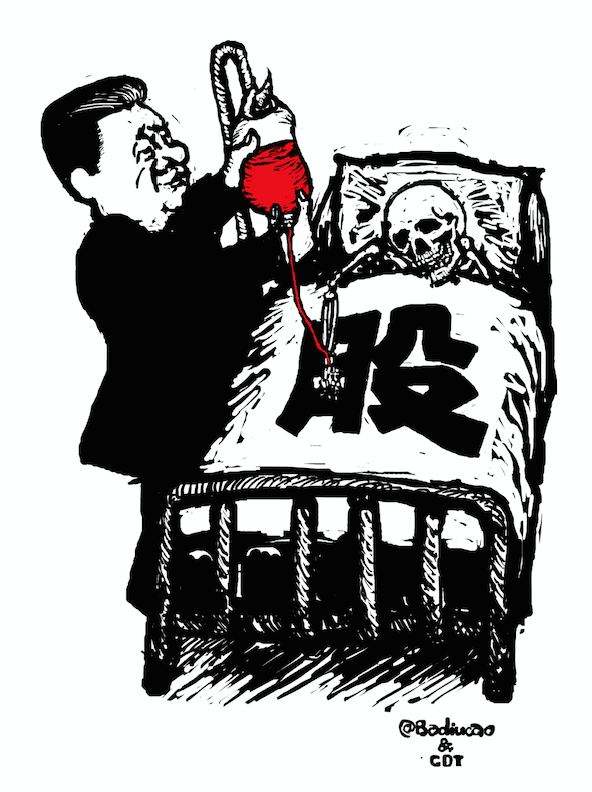 Mr. Xi has also been unafraid of making enemies with an unrelenting anti-corruption campaign. The government’s creation of the Chinese bull market has disproportionately benefitted state-owned companies—and therefore the Communist Party—by replacing government-guaranteed debt with equity. That equity, of course, has been funded by the little guy—the second, and much bigger, part of the problem. When the state press and government officials began pumping stocks about a year ago, they essentially made a promise to protect the savings of tens of millions of households. However, the stated strategy might leave them high and dry, says Andrew Collier, head of Orient Capital Research. Given the intensity of Beijing behind the operations, the liquidity the PBoC provides to the market via brokerages is likely to be many times larger than the announced 120 billion yuan. […] Beijing, which has shown itself to be adept at deflecting popular blame for its mistakes in the past, is quickly finding out that its usual methods don’t work so well when millions of Chinese suddenly find their equity just isn’t what it used to be, and start looking for someone to blame. […] Government stock touts weren’t the only reason that Chinese investors piled into the markets (a cooling housing sector and low interest rates had many Chinese in search of returns). But when the strongest government China has seen in decades tells investors that equities are the way to go, and reacts to market drops by providing you more opportunity to leverage yourself (among other measures), it creates the illusion – if not the belief – that the government is keeping the markets safe. When those markets turn out to be otherwise, there’s only one Party to blame.